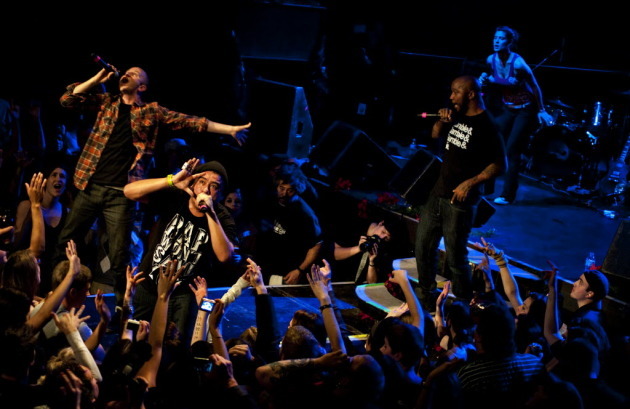 Doomtree performs at First Avenue for Blowout VI. Photo by Leslie Plesser. The beloved, banging Doomtree crew is putting on a rare group show. "This has been the year of the side project," said Aaron "Lazerbeak" Mader, CEO of Doomtreee, a hip-hop collective whose members include Dessa, P.O.S. and Sims. So this sold-out Friday show -- dubbed Doomtree Forest -- gathers those solo and side-projects, then culminates in a full-crew set. The name nods to the Doomtree family tree. "We've always played at least one show a year as a full crew, even at the height of craziness for everyone, solo-wise," said Mader, producer and beatmaker. "It's very rare that the seven of us are in the same city, let alone the same room anymore. "But we always wanted to at least come together once a year." For a decade, they came together for the Doomtree Blowout, "where would take over the city for like a week," Mader said. Then there was Doomtree Zoo, "our attempt at a big one-day music festival." Doomtree Forest is "almost the complete opposite of that -- as much of a pop up show as possible." The crew is transforming Familia HQ, an indoor skate park, installing 10-foot trees and lights on the ceiling to look like stars. On the docket: Shredders. Revived rap duo Four Fists, a.k.a. P.O.S. and Astronautalis. A new project by Paper Tiger. And a set from Dessa, who recently put out a solo album and is on the verge of releasing her debut memoir.